There have been many reports in the literature on chiropractic care and its efficacy. However, the reporting is often “muddled” based upon interchangeable terminology utilized to describe what we do. The etiology of the verbiage being used has apparently been part of a movement to gain acceptance within the healthcare community, but this attempt for a change in view by the healthcare community has cost us. Currently, the scientific community has lumped together manipulation performed by physical therapists or osteopaths with chiropractic spinal adjustments because all three professions perform “hands on” manual therapy to the spine. For example, Martínez-Segura, De-la-LLave-Rincón, Ortega-Santiago, Cleland, and Fernández-de-Las-Peñas (2012) discussed how physical therapists commonly use manual therapy interventions directed at the cervical or thoracic spine, and the effectiveness of cervical and thoracic spine thrust manipulation for the management of patients with mechanical, insidious neck pain. Herein lies the root of the confusion when “manipulation” is utilized as a “one-size-fits-all” category of treatment as different professions have different training and procedures to deliver the manipulation, usually applying different treatment methods and realizing different results and goals. In addition, as discussed by Sung, Kang, and Pickar (2004), the terms “mobilization,” “manipulation” and “adjustment” also are used interchangeably when describing manual therapy to the spine. Some manipulation and virtually all chiropractic adjusting “…involves a high velocity thrust of small amplitude performed at the limit of available movement. However, mobilization involves repetitive passive movement of varying amplitudes at low velocity” (Sung, Kang, & Picker, 2004, p. 115). To offset confusion between chiropractic and any other profession that involves the performance of some type of manipulation, for the purpose of clarity, we will be referring to any type of spinal therapy performed by a chiropractor as a chiropractic spinal adjustment (CSA) and reserve manipulation for other professions who have not been trained in the delivery of CSA. Until now, the literature has not directly supported the mechanism of the CSA. However, it has supported each component and the supporting literature, herein, will define the neuro-biomechanical process of the CSA and resultant changes. Both human and animal studies have shown the tri-phasic process of the CSA and the time for the thrust duration of each phase. In addition, the timing at each phase has been shown to be integral in understanding the neurological effect of the CSA. The forces are broken into 3 phases. These are the pre-load force, which takes the tissue close to its paraphysiological limit, the peak force or thrust stage and the resolution stage. Note. “Spinal Manipulative Therapy and Somatosensory Activation,” by J. G. Pickar and P. S. Bolton, 2012, Journal of Electromyography and Kinesiology,22(5), 787. Copyright 2012 by Elsevier. Pickar and Bolton (2012) reported that the physical characteristics of an CSA may vary based upon the technique being used and the individual practitioner. However, the above scenario is an illustration and guide to the time and force for of a CSA. Note. “The Effects of Side-Posture Positioning and Spinal Adjusting on the Lumbar Z Joints: A Randomized Controlled Trial with Sixty-Four Subjects,” by G. D.Cramer, D. M. Gregerson, J. T. Knudsen, B. B. Hubbard, L. M. Ustas, & J. A., 2002, Spine,27(22), 2462. Copyright 2002 by Lippincott Williams & Wilkins. What makes this significant is the residual time that occurs after the CSA. During this period, and the time that follows is the foundation for biomechanical changes in the adjacent discs and ancillary connective tissue attachments that will be discussed in the next article in the series. 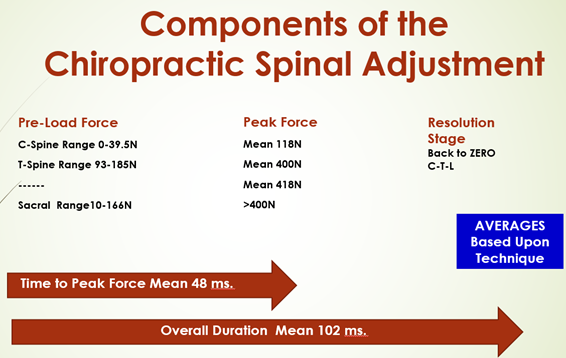 However, this is part of the foundation for bio-neuro-mechanical changes to the spine secondary to the CSA. …on flexion of the lumbar spine, the inferior articular process of a zygapophyseal joint moves upward, taking a meniscoid with it. On attempted extension, the inferior articular process returns toward its neutral position, but instead of re-entering the joint cavity, the meniscoid impacts against the edge of the articular cartilage and buckles, forming a space-occupying "lesion" under the capsule: a meniscoid entrapment. 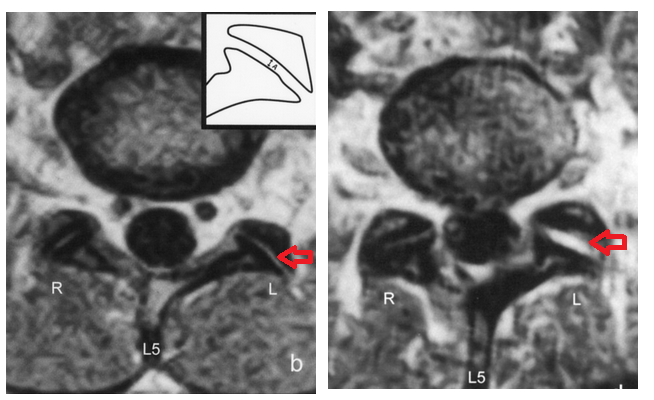 A large number of type III and type IV nerve fibers (nociceptors) have been observed within capsules of zygapophyseal joints. Pain occurs as distension of the joint capsule provides a sufficient stimulus for these nociceptors to depolarize. Muscle spasm would then occur to prevent impaction of the meniscoid. The patient would tend to be more comfortable with the spine maintained in a flexed position, because this will disengage the meniscoid. Extension would therefore tend to be inhibited. This condition has also been termed a "joint lock" or "facet-lock" the latter of which indicates the involvement of the zygapophyseal joint. The presence of fibro-adipose meniscoids in the cervical zygapophyseal joints suggests that a similar phenomenon might occur, but in the neck the precipitating movement would be excessive rotation. The clinical features of cervical meniscoid entrapment would be those of an acute torticollis in which attempted derotation would cause impaction and buckling of the entrapped meniscoid and painful capsular strain. Muscle spasm would then occur to prevent impaction of the meniscoid by keeping the neck in a rotated position. Under these circumstances the muscle spasm would not be the primary cause of torticollis but a secondary reaction to the entrapment of the meniscoid. Zygapophyseal joint gapping induced during an HVLAT manipulation would further stretch the highly innervated joint capsule, leading to a "protective" reflex muscular contraction, as shown in electromyographic studies. The most important characteristic of a manipulative procedure that will provide joint gapping, before the induction of protective reflex muscular contraction, would be high velocity…the thrusting phase of an HVLAT manipulation required 91 ± 20 ms. to develop the peak force. If this period is compared with the time delay between the onset of the thrusting force and the onset of electromyographic activity, which ranges from 50 to 200 ms., we can see that a force of sufficient magnitude to gap the joint can be applied in a shorter time than that required for the initiation of a mechanoreceptor-mediated muscular reflex. Furthermore, once the muscle is activated (i.e. there is an electromyographic signal), it will take approximately another 40 to 100 ms until the onset of muscular force. It therefore seems unlikely that there are substantial muscular forces resisting the thrusting phase of HVLAT manipulation. Thus, HVLAT manipulation would again appear to be the treatment of choice for a meniscoid entrapment. Meniscoid entrapment. A) On flexion, the inferior articular process of a zygapophyseal joint moves upward, taking a meniscoid with It. B) On attempted extension, the inferior articular process returns upward to its neutral position, hut instead of re-entering the joint cavity, the meniscoid impacts against the edge of the articular cartilage and buckles, forming a space-occupying "lesion" under the capsule. Pain occurs as a result of capsular tension, and extension is inhibited. C) CSA (Manipulation) of the joint involving flexion and gapping, reduces the impaction and opens the joint to encourage re-entry of the meniscoid into the joint space (D) Realignment of the joint. Note. “Mechanisms and Effects of Spinal High-Velocity, Low-Amplitude Thrust Manipulation: Previous Theories,” by D. W. Evans, 2002, Journal of Manipulative and Physiological Therapeutics, 25(4), 253. Copyright 2002 by Elsevier. This first part of a 5-part series covers the osseous mechanics of what the chiropractic spinal adjustment is comprised of. Part 2 will cover the ligamentous involvement from a supportive and neurological perspective. The topic of part 3 will be spinal biomechanics and its neurological components. Part 4 will be an in-depth contemporary comparative analysis of the chiropractic spinal adjustment vs. physical therapy joint mobilization. The final part will be a concise overview of the chiropractic spinal adjustment. 1. Martínez-Segura, R., De-la-LLave-Rincón, A. I., Ortega-Santiago, R., Cleland J. A., Fernández-de-Las-Peñas, C. (2012). Immediate changes in widespread pressure pain sensitivity, neck pain, and cervical range of motion after cervical or thoracic thrust manipulation in patients with bilateral chronic mechanical neck pain: A randomized clinical trial. Journal of Orthopedics & Sports Physical Therapy, 42(9), 806-814. 2. Sung, P. S., Kang, Y. M., & Pickar, J. G. (2004). Effect of spinal manipulation duration on low threshold mechanoreceptors in lumbar paraspinal muscles: A preliminary report. Spine, 30(1), 115-122. 3. Pickar, J. G., & Bolton, P. S. (2012). Spinal manipulative therapy and somatosensory activation.Journal of Electromyography and Kinesiology,22(5), 785-794. 4. Cramer, G. D., Gregerson, D. M., Knudsen, J. T., Hubbard, B. B., Ustas, L. M., & Cantu, J. A. (2002). The effects of side-posture positioning and spinal adjusting on the lumbar Z joints: A randomized controlled trial with sixty-four subjects.Spine,27(22), 2459-2466. 5. Cramer, G. D., Henderson, C. N., Little, J. W. Daley, C., & Grieve, T.J. (2010). Zygapophyseal joint adhesions after induced hypombility. Journal of Manipulative and Physiological Therapeutics, 33(7), 508-518. 7. Owens, Jr., E. F., Hosek, R. S., Sullivan, S. G. B., Russell, B. S., Mullin, L. E., & Dever, L. L. (2016). Establishing force and speed training targets for lumbar spine high-velocity, low-amplitude chiropractic adjustments. The Journal of Chiropractic Education, 30(1), 7-13. 8. Nougarou, F., Dugas, C., Deslauriers, C., Pagé, I., & Descarreaux, M. (2013). Physiological responses to spinal manipulation therapy: Investigation of the relationship between electromyographic responses and peak force.Journal of Manipulative and Physiological Therapeutics,36(9), 557-563. 9. Solomonow, M. (2009). Ligaments: A source of musculoskeletal disorders.Journal of Bodywork and Movement Therapies,13(2), 136-154. 10. He, G., & Xinghua, Z. (2006). The numerical simulation of osteophyte formation on the edge of the vertebral body using quantitative bone re­modeling theory. Joint Bone Spine, 73(1), 95-101.